Our project is now at the stage where the two footprints that compose our PCB are spread out in the Pcbnew canvas. In this chapter we will do the footprint placement so that we can start giving shape to the final PCB. The current state of the PCB design. 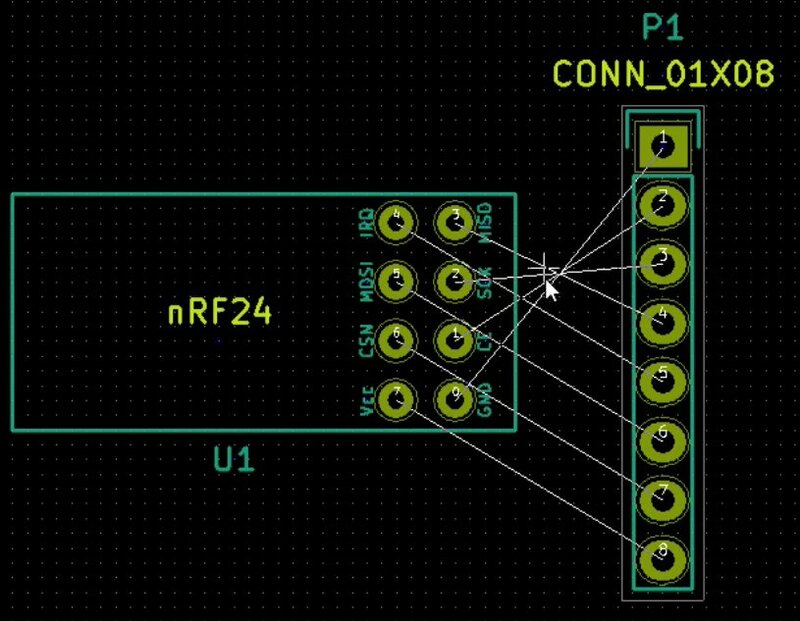 I would like to place the connector on the right side of the breakout and the nRF24 component on the left side. To so this, position the cursor over the nRF24 footprint and hit the ‘M’ key. This will allow you to move this footprint. Move it so that it is on the left side of the straight connector. The nRF24 footprint is on the left side of the connector. Notice the rattiest lines. They indicate the pads that should be wired together. The thin white lines that connect the pads together are called “ratsnests” . They are routing guides. As we wire each pair of pads together, the corresponding ratsnest will disappear. One thing to consider when you are placing your components onto your PCB is space. How much space is your final PCB going to take up? Remember that PCB manufacturers, will charge you not based on have many holes and tracks your PCB has but based on its dimensions. Therefore, the smaller your PCB is, the cheaper it will be to make. However, the smaller the PCB is, the harder can be to route it. With less space in between footprints, the routing of tracks will be more difficult. 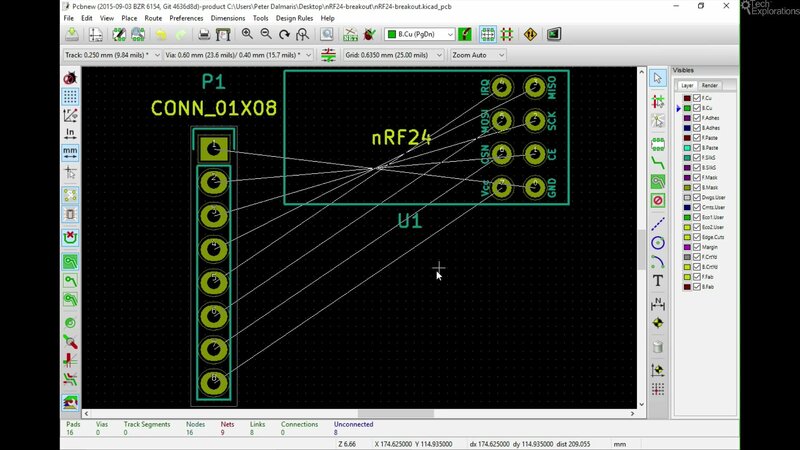 This is not a problem for the simple PCB of this example, however if you had more footprints, then placing them to close to each other would make routing and then soldering harder. You must think about this and find a dimension that works both from a cost point of view and from these other technical considerations like the soldering and the routing point of view. In the next chapter we will look into the PCB edges, known as edge cuts, that define the border of the PCB. After that, we will be able to go ahead to complete the wiring.